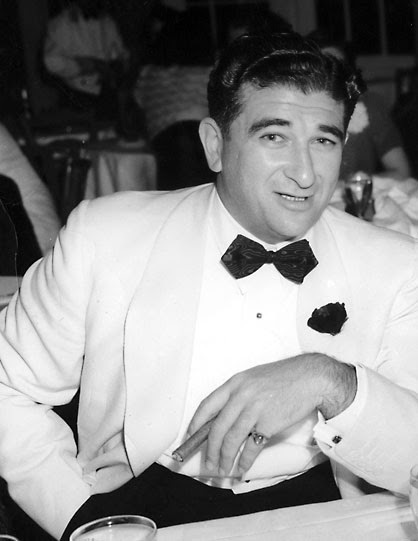 With the exception of Meyer Lansky, Abner "Longy" Zwillman was the most feared and respected member of the "Jewish Mafia," the tough, bright Jewish gangsters who played a key role, certainly the equal of the Mafia-bred mobsters under Lucky Luciano, in forming the national crime syndicate. Like Lansky, Zwillman sat in on the top council meetings of the syndicate, and there was no nonsense, as has been much perpetuated in recent years, that said only Italians could vote. Despite various descriptions of the national commission of the Mafia—which was actually limited in scope and authority—the ruling group of the syndicate was the so-called Big Six, equally divided between Italians and Jews. Members of this group (after the imprisonment of Luciano) who continued to rule into the early 1950s were Lansky, Zwillman, Frank Costello, Joe Adonis and Tony Accardo, and Greasy Thumb Guzik. Zwillman worked closely with Lansky, Luciano, Costello and Willie Moretti in the early days. Moretti, an early boss of a tough Jersey crime family, was his junior partner and provided murder muscle when Zwillman needed it. Zwillman was one of the key figures in the new combination's successful efforts forcibly to absorb the Dutch Schultz empire. In the process, Zwillman became the undisputed boss of crime in New Jersey, in fact becoming identified as "the Al Capone of New Jersey." His political power in New Jersey was awesome. Officials in many localities hopped to his tune, and, in 1946, Republican governor Harold G. Hoffman personally solicited Zwillman's support. Three years later, the mobster passed the word to the Democratic candidate for the governorship, Elmer Wene, that he would contribute $300,000. All Zwillman wanted in return was the right to name the state's attorney general. Wene refused and lost the election. The Zwillman-Moretti syndicate worked the state on a grand scale, and they operated a plush gambling casino in the Marine Room of the Riviera nightclub on the Palisades just above the George Washington Bridge. As a nightclub, the Riviera operated with star entertainers and was always mobbed by patrons eager to see the floor show. Entry to the Marine room, which was protected by guards, was much more difficult. As New York Times crime reporter Meyer Berger noted, "All players had to be known. Outsiders saw only the dining rooms. " Zwillman tried to maintain a respectable face. When the syndicate started getting heat in the 1932 hunt for the kidnapped Lindbergh baby, Zwillman relieved the pressure with a public relations coup, posting a large reward for the kidnapper. In the early 1950s, he invaded a number of legitimate businesses and sought the image of a civic-minded citizen, in one case donating $250,000 for a Newark slum clearance plan. However, that facade crumbled when in the late 1950s the McClellan Committee turned its rackets investigation spotlight on his activities. Subpoenaed by the committee and harassed by an IRS probe of his taxes, Zwillman started to take on a hangdog look. At the same time, his problems within the syndicate increased. Zwillman incurred the wrath of Vito Genovese when he voted against that ambitious mobster who wanted to force Costello out of power. Then he guessed wrong by backing Albert Anastasia against Genovese. After Anastasia was murdered in 1957, other crime leaders began edging in on Zwillman's New Jersey rackets. Given the sum total of the pressures on him, it did not seem especially surprising that Zwillman was said to have committed suicide on February 27, 1959, just before he was slated to appear before the McClellan Committee. There were, however, some troubling details about Zwillman's suicide. Apparently, he had managed to strangle himself with a plastic rope in the basement of his luxurious $200,000 mansion in West Orange, New Jersey. That clearly seemed to be a clumsy method of suicide. Additionally, there were unexplained bruises on his body and strong indications that his hands had been tied with some kind of wire. Whether or not Zwillman took his own life, his death must have been a great relief to members of the crime syndicate—especially Meyer Lansky, who feared Zwillman was growing too old to take the heat and might turn informer to avoid prison. In later years, Lansky insisted to Israeli biographers that he had not ordered Zwillman's death, that it had been decreed by Genovese. In exile in Italy, Luciano, who was critical of Lansky for not coming to the aid of an old comrade, said the job was done on orders of Carlo Gambino after Zwillman tried to put the bite on him following Genovese's imprisonment. However, no assassination of Zwillman could have taken place without Lansky's approval (just like a dozen years earlier, when Bugsy Siegel was dispatched). The underworld version holds that Zwillman was killed, but with a measure of respect. The boys came to him and told him he had to go. Longy didn't want to die, but they explained patiently there was no other way. They even brought along a bottle of expensive brandy to ease the elderly hoodlum's passage. When he was feeling no pain, they trussed him up so that he would not flail wildly and suffer and then they hanged him from a water pipe in the basement of his house.